Power banks are quite a rage now, and if you are technologically challenged or simply don’t know about it, let me help you. Power banks are portable chargers that provide portable power to charge a phone’s battery and other similar items that have a USB interface. They allow you to store electrical energy and then later use it to charge your devices. They have become more popular and loved as the battery life of our beloved devices are stripped down by the amount of time we spend on them. By keeping a battery backup you can save yourself from so many situations. Keeping a Power Bank is a smart choice, you won’t have to worry about your battery running out or panic when you are away from a wall socket. Now the question arises that with the number of power banks available you are either spoiled for choices or are left confused. That is why we have made this list for you. If you are just dipping your toes into this technology or just are on a tight budget, fret not. In this list, we will tell you about the Best Power Banks under 1000 Rupees in India that you can buy. We have also listed the pros and cons, hence it would be easier for you to make a choice. 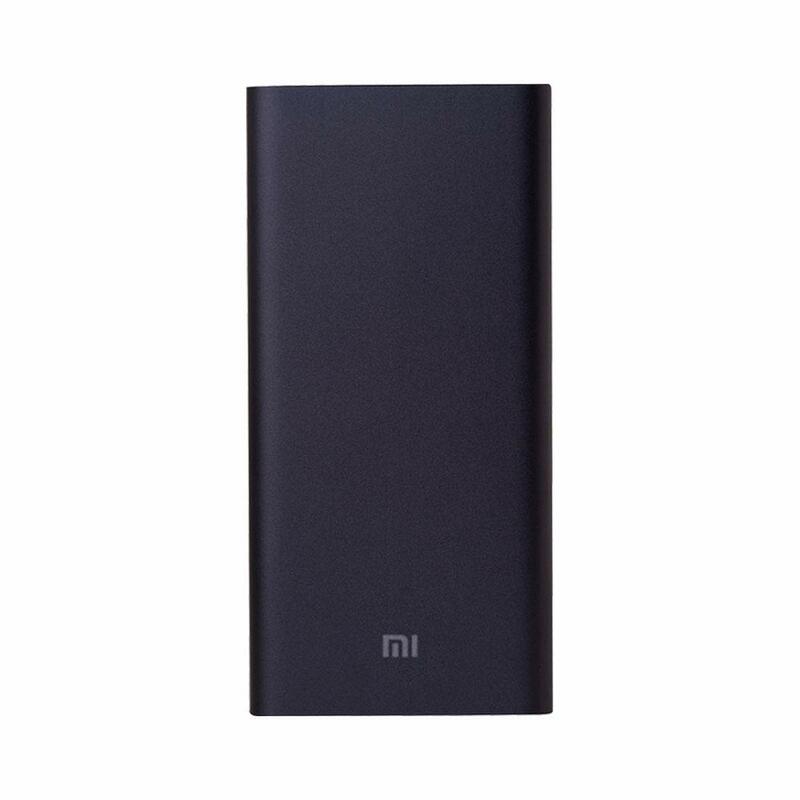 Xiaomi recently launched its made in India Mi power bank 2i for Rs 799 and it’s on the top of my list for all the right reasons. There is a choice between 10,000 mAH capacity or the 20,000 mAH capacity. Here we are talking about the 10,000 mAH Mi Power bank. The design of the power bank is same as previous Mi power bank 2, the only dimension is changed. It has an aluminum body and the look of it is premium and classy. It feels solid in hand and has a smooth aluminum finish to it. This type of premium look and design is what you don’t expect in this price range. The power bank has curved corners and 180-degree ergonomic arc design. On the back side, you can find SR rating info. There is input/output voltage info on the bottom side. 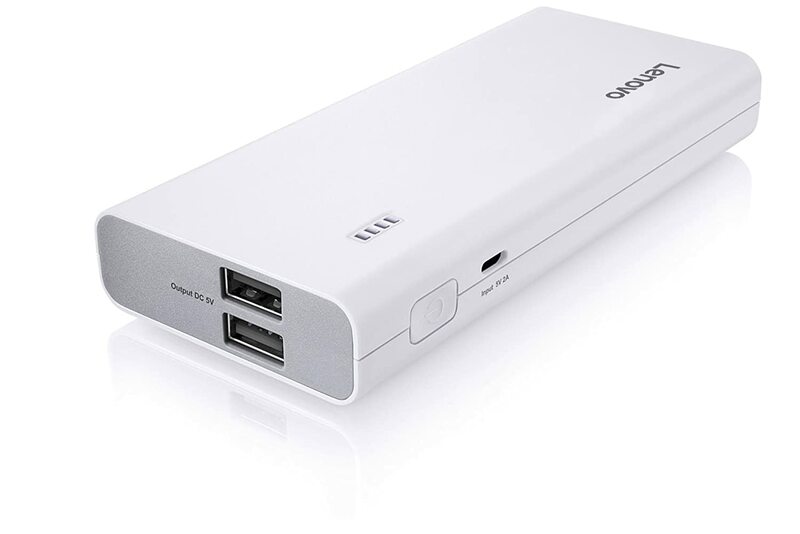 The Mi power bank has 2 2.4A USB output ports. Fast charging input & output. Intex IT-PB11k is my second choice in this list. on the design front, it looks unique and stylish with a white and grey color combination. If you aren’t a fan of white color then there is another variant available for you black-grey. When coming to build quality it comes with solid build quality. It has an Intex logo in the middle of a top side and Power on/off button and blue LED light indicators on the corner. The LED indicator light is very bright and it shows you remaining power and charging status. On the right side, Intex has a three USB output with 1A, 2A and 2A capacity. The bottom side you can find Label of an output port, BIS rating, and specifications. The Intex power bank gives 8500 mAH capacity out of full capacity. The 2.1V port full charges your 2500 mAh battery within1.10 hours and 1V port charges within 1.50 hours. I don’t recommend you to charge 3 devices at once because of safety and heating reasons. Overall this is a good power bank at this price range. The performance and look of the Power bank is quite good. It also comes with a 1-year warranty. Very Good Efficiency (81% conversion rate). 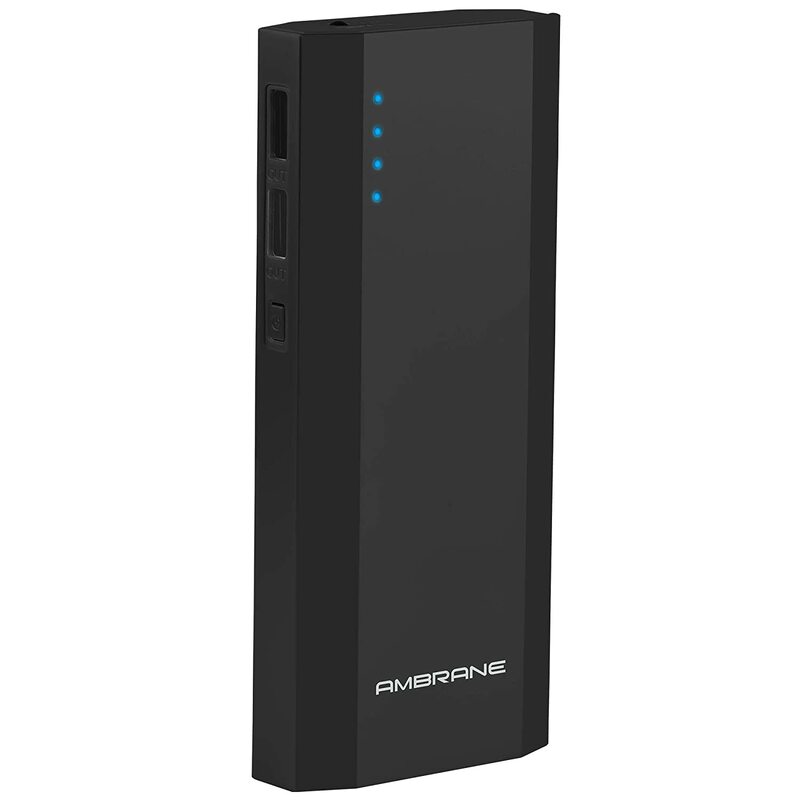 Ambrane P-1111 10000 mAH power bank is also a good choice under a budget. Talking about design it looks very stylish and premium with leather finishing. 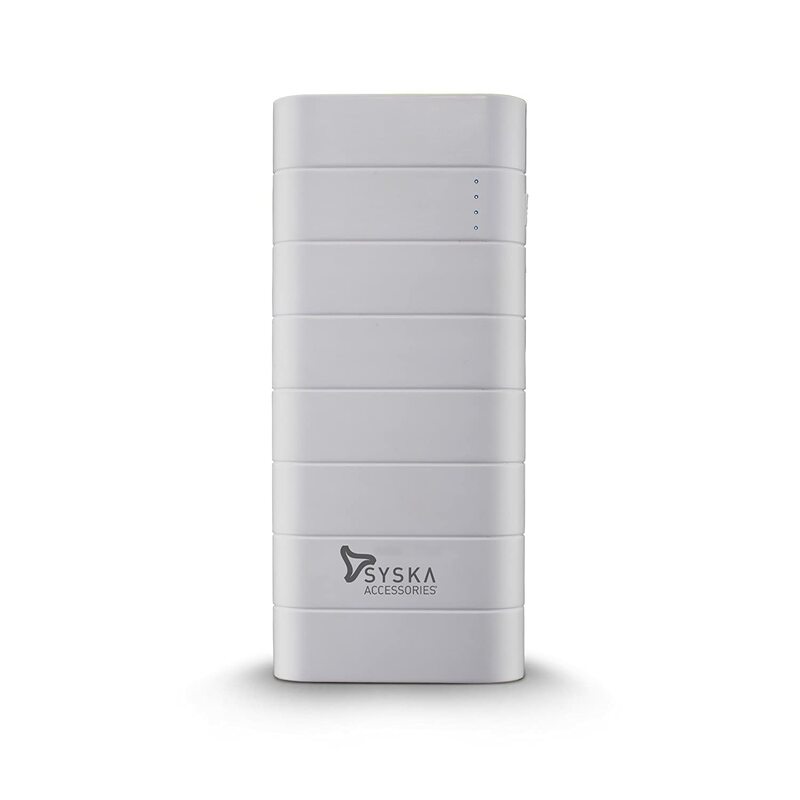 The power bank is also compact in size which makes it easy and comfortable to carry while traveling. Ambrane is a well known Indian based company. Due to low prices and bigger battery size, Ambrane is taking over the power bank market in India. 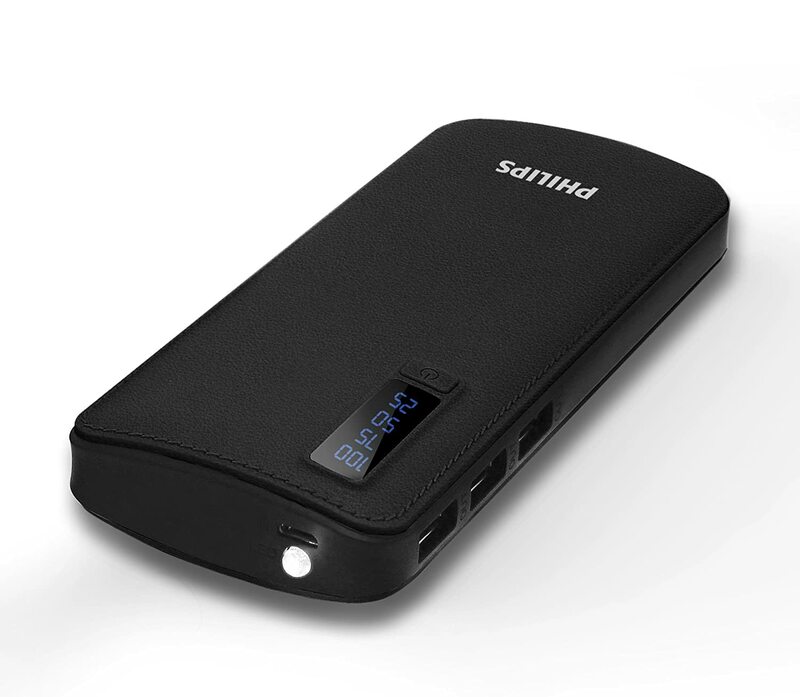 This power bank comes with 10000 mAH Lithium-ion battery. The battery comes in a protective circuit that increases its lifespan. It can easily provide about 7000 mAH useful output power to mobile. 2.1A dual port fast charging. Does not support pass-through charging. 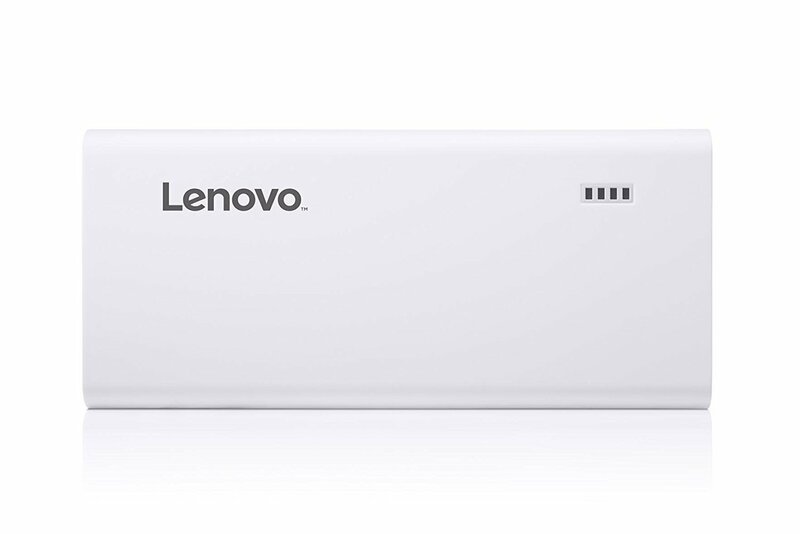 Lenovo 13000 mAh Lithium-ion Power bank is a good choice at this price. the look of the Power bank is quite good and comes in a white color compact design. It is also not heavy. It weighs just 281 g.Ṭhe power bank looks good with its rounded edges and white body. At the top side, it has Lenovo branding and LEd indicators light to show power level. At top side, it has a power button and micro USB port. The power button is just to check the power level. At the left side, you will see two USB ports. So you can charge up two smartphones simultaneously with this power bank. It has the battery capacity of 13000 mAH. It can charge a smartphone with 2000 mAH battery up to 5 times full. If you have a smartphone with a larger battery capacity this number will reduce depending on capacity. The power backup and efficiency is exceptional for the price paid. Though the power bank has two outputs for charging only one USB cable is provided, this shouldn’t be a big concern as finding a spare cable is not a hard task. Dual USB port (two-2.1A output). 3. 13000 mAh battery for your all-day usage. The power bank has just two outputs. Comes with just one cable. If you are looking for a lightweight power bank from a well established trusted brand as considering trusted brands while buying electronic accessories like power bank is always a good idea hence Lenovo 10400 is a good buy at its price and capacity. It has 10200 mAH battery capacity so it falls under 10000 mAH category. This power bank comes in white and black color. The power bank has 14.1 cm height, 6.4 cm width, 2.2 cm thickness and weighs 250 g, which makes it handy and easy to carry. The size of the power bank is almost like 5 to 5.5 inches screen phone, though it is a bit thick it can easily fit in your pocket. The built quality of the power bank is moderate and not so well crafted but made from good quality plastic. It has power on/off button and 4 LED indicators to show battery status. It has 2 USB outputs, both are of 2.1 A and can charge two devices at the same time. The charging time of this bank is about 5-6 hours with a quick charger and 7-8 hours with a normal charger. If we talk about safety, it is protected from overcharging, over discharging and short circuit. It also comes with one year warranty. Takes very less time to charge itself. The built is quite moderate. Philips 11000 mAH power bank is a great choice if you want a power bank at this rate from a reputed company. The Philips power bank has an elegant look with a white body and leather finish. It’s not just a bland necessity but an edgy accessory. The seven segment display LED is blue in color and displays the current battery percentage. It lights up when the device is connected. While the right side is plain the left side houses the three USB ports. These are rated at 5V-1A. On the top end, you can find the micro-USB port through which you can charge the power bank and right next to it is the torch. The power bank is a bit heavy weighing at 1.7 kg which is courtesy to its Lithium-ion Battery pack over the Lithium Polymer Battery Pack which tends to be heavier and bigger to the latter. So carrying the bank would be quite difficult for anyone who likes to use their mobile while charging their phone. Also, the micro-USB cable that comes along with it is quite short. Even though it is a low-cost power bank it doesn’t look or feels flimsy. Takes time to charge itself. Doesn’t heat up while charging. Takes a lot of time to charge itself. Takes a long time to charge phones. IPRO is a Japanese company. The real company name of Ipro is Hako. Ipro power banks are kn0wn for its sleek and smart designs and IP 1042 is no exception for that. 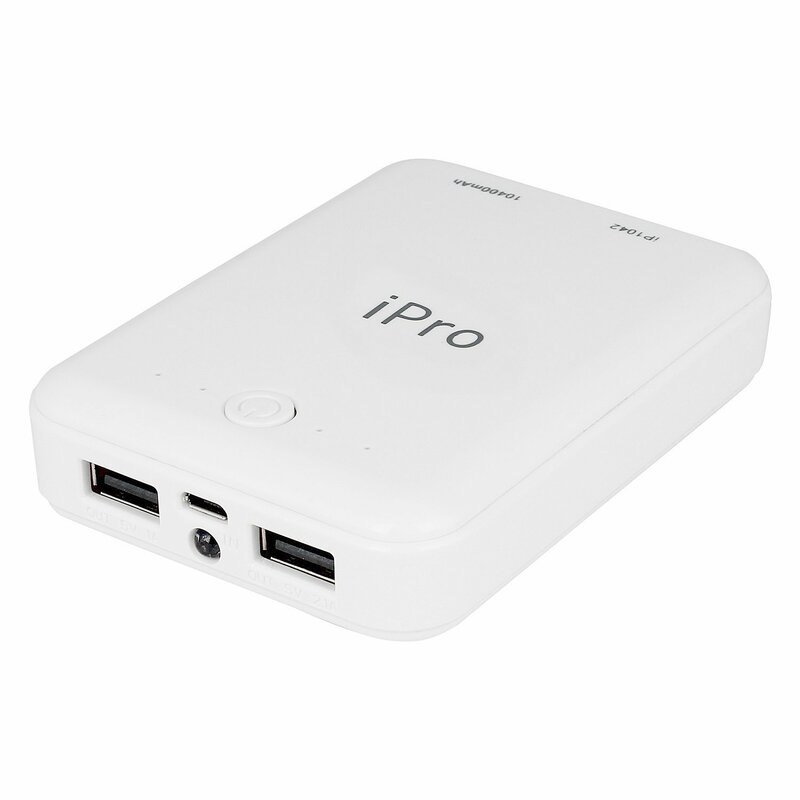 Ipro IP1042 is a 10400 mah power bank. You can use it to charge smartphones, tablets, camera etc. It has a very compact design. It is 9 cm long, 7 cm broad and 2 cm thick. The weight of the power bank is 213g which makes it extremely handy and portable. The built quality of the power bank is not so good but is made from good quality plastic. It comes with a power on/off button and 4 LED indicators to show battery status. The power bank has 10,400 mAH battery capacity and gives 7000 mAH output which is a 70% conversion rate which can be considered decent from mid-range power bank. The power bank has two USB charging ports one is of 1A and the other one is of 2.1 A. It takes only 4 hours to charge itself with a fast charger and 9 hours with a normal charger. It does not support quick charging. It also has a LED torch which is not so bright but will surely help you in an emergency. It comes with a one-year manufacturer warranty. Battery backup is top notch. 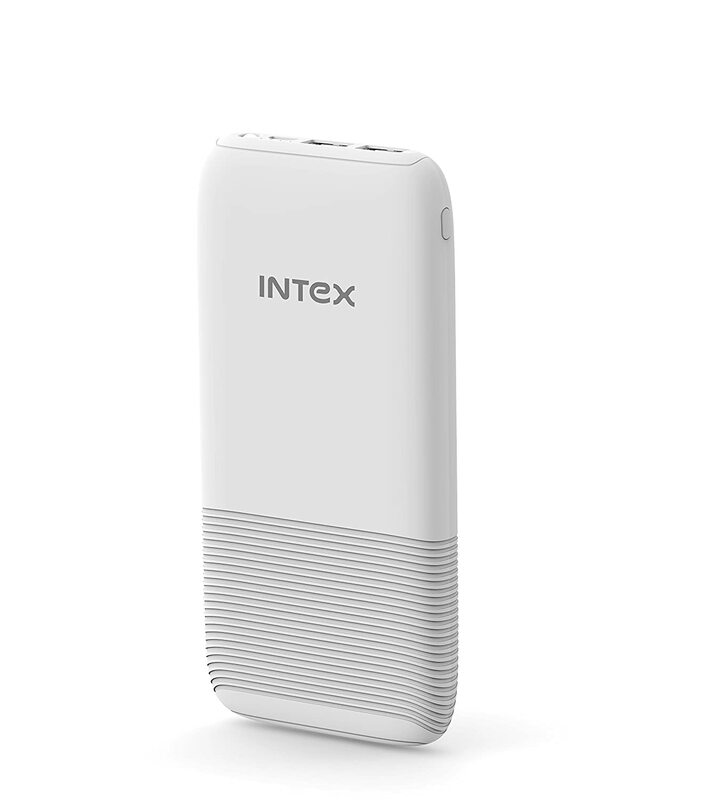 Intex has a high powered variant for its power banks. The Intex 12000 mAH power bank is no less. It comes sleek and elegant designs. This power bank works for every mobile, tab and other electronic devices like speakers, headsets etc. It comes with 12000 mAH lithium polymer battery. The power bank comes with Polymer battery and hence is slimmer, lighter and has a better longevity. It weighs around 230gm which makes it compact and handy and is easier to travel with. It has 3 light indicators to show much it is charged. It has a USB connector which enables you to connect it to any gadget through USB cable. It comes in many colors so you can choose one that suits your style. The Power bank has a glossy finish and stylish look which in this price range is quite good. The product comes with one year warranty provided by the manufacturer from the date of purchase. Takes time to get charged. Billion is an Indian brand started by Flipkart with a mission to make made for India products. These products are exclusively sold on Flipkart and there a variety of products sold under the brand Billion. The Billion power bank has a standard output of up to 2.1 Ampere current while most power banks have 1 Ampere current. This means the device’s that support fast charging will be charged 2 times faster. So if your device takes 1 hour to charge it will charge in 30 minutes using this power bank. A large 15000 battery ensures that even if you are out for a long time you will have enough charge to make you last longer on your phone. There is not one but 2 USB output ports with which you can simultaneously charge two devices. It also features 7-way protection and safety to ensure that there is no damage to the devices or the power bank in any way. These safety features include protection against under voltage, over voltage, short circuit, overheating etc. There are 4 LED indicator lights to display the charging status of the power bank. It also has a built-in LED flashlight which comes handy while traveling. At a price so less and in a budget, this power bank loaded with so many features is a great deal. The device will automatically power itself off. The 5 Volt 2.1 Ampere output can charge most devices pretty fast. Cable provided with the power bank is just too small. This was our list of the Best Power Banks Under Rs 1000 in India. Now you can make your choice and choose a power bank that suits your liking and budget. Keeping a power bank is a smart choice, this will ensure that you never run out of battery in emergency situations. And since this list is under Rs 1000 you won’t be shelling out much money. If we have missed out on any device or if you have a personal recommendation comment it down below. If you want us to cover any topic in future then mention it below. Also, don’t forget to share this article with your friends.